E-Book Covers – Refresh, Redo or Rebrand? During December I finally got around to what had for a while been on my mental to-do list for a while, namely to change the front covers for the e-book versions of both the Nameless War and the Landfall Campaign. I was never entirely happy with my first efforts and as a consequence of my ongoing Ships of the Fleet project my 3D modelling skills are definitely better now than they were three years ago. I did wonder whether this would have any effect on actual sales. And the answer a month and a bit down the line is…. maybe. December probably wasn’t the best time to undertake this change if I wanted to try to study the effects of this change. Over Christmas a lot of new e-reader devices hit the market simultaneously and obviously that has an effect on sales. Still my sales, which after the glory days of just after the launch of book two, had been bobbling along at under a hundred per month, close to doubled. Also I did notice that my Amazon ranking has on average improved. But a lot of different and in many cases uncontrollable factors could be coming in play. So far so ambiguous. 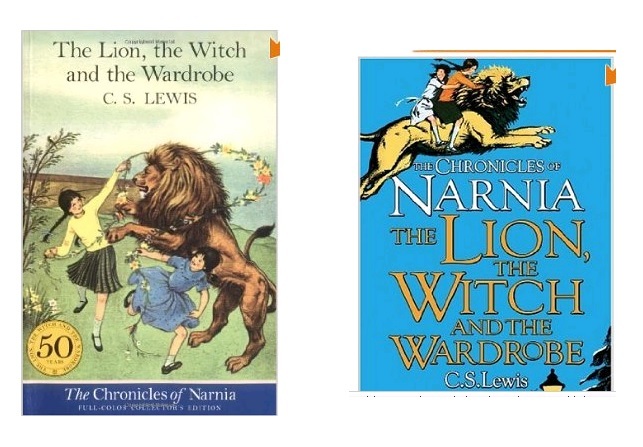 The relevant the cover art for e-books – given that the image will be the size of a postage stamp on the screen of an e-reader – is subject to debate but the whole exercise has got me thinking. The conventional advice is that you get everything right before publishing. But in the case of cover art is there a right answer? Below is one of my childhood favorites. The edition I read was one on the left, the one on the right is I assume the current edition. So, same book, same title, same author, different cover; or perhaps we should say different branding. Back in the days of yore (so ten years at most) when books only existed in dead tree format, they would get printed in runs of hundreds to thousands, depending on expected popularity. If the book did well enough to justify further runs then every so often a new edition would be prepared with a new cover. Why update at all? If the cover on the left was judged good enough in the seventies or eighties when the copy I read was presumably printed, then what’s wrong with it now? Well obviously times have moved on. Styles and expectations changed but also the familiar can slowly become the ignored. No publisher wants their titles to lie gathering dust and an old familiar cover become easier for the book buyer to pass over on route to something newer and shinier. This applies to really everything that can be bought and sold, so even if the product remains unchanging, the wrapping needs to be refreshed every so often. But returning to e-books. As I’ve said before, once an e-book hits the digital shelves it could potentially stay there forever. Unlike the finite shelving of a physical bookshops there is no space limitation. But this means that a given title is in competition with every other book available and with each new year thousands more books will join it. Again, as I have said before, the self publisher has to think into the long term. At the very least a the cover art will likely have to rejuvenated every few years to keep up with style changes. But should we be thinking in terms of ‘the very least’? Unlike physical books the digital cover could, if the mood took you, be changed on an almost daily basis. Now that would probably be over the top but perhaps the self publisher should be thinking in terms of having two or three covers and cycling through them every six to twelve months. Just enough for them not to fade into background. I’m not selling this idea as part of the next get-rich-quick self publishing scheme. I have no evidence to back this line of thought up. But possibly it is something to be added to the self publishers tool box. If you want to compare my old cover to the new, the links to Amazon below are the new, I haven’t got round to updating the Smashwords. A re-blog of an article by one Kameron Hurley that I came across on the the Passive Voice which I thought was worth forwarding because I am utterly guilty of this. The whole piece can be found on Locus Online here. When I published my first novel 20 years later, I found myself faced with the same challenge: how do I talk about this book to people whose entire conception of science fiction and fantasy are built around Star Wars andThe Hobbit? How do I convince folks that stories about the dissolution of a marriage in Montreal in 2155 are just as serious an endeavor as writing about the dis­solution of a marriage in Montreal 1955? I anticipated their reactions, and pulled my punches. One might think I said these things in a pure fit of shame. But as I got older and moved in geekier and geekier circles with folks who loved the same books I did, I recognized that some of this was not shame, but pride. There was some elitism in it of the, ‘‘People like me just get this and you won’t’’ variety. That’s not pulling a punch. That’s punching yourself in the face. I started to wonder if I was limiting my potential readership in the way I was talking about what I wrote. These dual feelings of shame and pride were difficult to juggle. I recognized that my pride was fueled by the shame. Acknowledging to the world that I was wasting my time writing non-serious books about interstellar genocide and religious and political strife, I figured I could save face by letting folks know outside the genre that I was in on the joke, while secretly knowing that a few brave SF/F readers didn’t need me to use small words. It is definitely one of those things in modern society that to enjoy, never mind produce science fiction, is something that should at the very least be kept under wraps. Yet it is absolutely not rational. Some of the biggest films and most ambitious TV series are now firmly in the SF&F bracket. It is no stretch of the imagination a fringe interest. * Although I have to admit when Mum read my work and I did wince at the thought of her reading across the bit with the succubus in the Job Offer.